Due to “a small group of rowdy teenagers,” the managers of the restaurant Dewey’s on 17th Street in Center City, Philadelphia decided to begin to refuse service to those patrons that were exhibiting “improper behavior.” This decision was expanded by some employees to mean “homosexuals and persons wearing non-conformist clothing," which, on April 25th, 1965, resulted in the refusal of service to over 150 people. Two teenage boys and one teenage girl proceeded to refuse to leave the premises when they were denied service. They, along with Clark Polak, a gay-rights leader in Philadelphia and editor of the LGBT-interest magazine DRUM who offered to find the youth a lawyer, were arrested and found guilty for disorderly conduct. 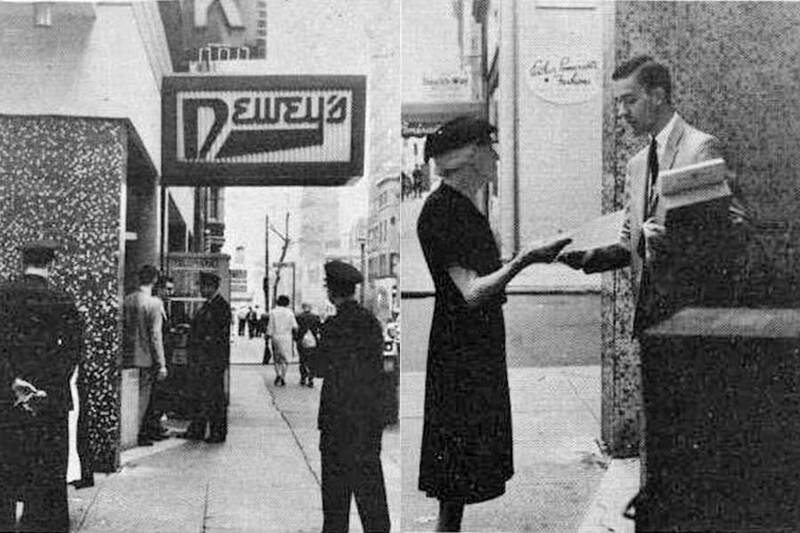 In the next week, the Janus Society, a Philadelphian homophile organization that began in the early 1960s as a more woman-oriented version of the Los Angeles/San Francisco based Mattachine Society that began in the 1950s, intervened in the protest by providing people and pamphlets to continue the protest against Dewey’s. Over the next 5 days, the original sit-in of the three teenagers served as an impetus for a “protest demonstration”, during which gay rights activists associated with Janus distributed over 1,500 pieces of literature in front of the restaurant while gay movement leaders negotiated demands with the management of the diner. On May 2nd, 1965, 7 days after the original sit-in, three people staged a second sit-in at the diner as a culminating attempt to ensure that the demands were met. At this demonstration no one was arrested. The police arrived at the diner and determined that they had no authority to force them to leave, and after an hour of holding the sit-in, the managers gave in to the negotiations. The newsletter of the Janus Society later reported that among the list of the action’s successes was “an immediate cessation to all indiscriminate denials of service.” DRUM magazine noted that this was “the first sit-in of its kind in the history of the United States” referring to the fact that it was the first documented instance in which a sit-in was held in support of the rights of gays, lesbians, and “non-conformists”. It was a stark rejection of the prior stance of other homophile organizations, such as Mattachine, that had built up its reputation on appearing “presentable” and “employable." The support of the Janus Society for those who dressed in a non-conformist manner, such as masculine women and feminine men, preempted this division that would continue throughout the homophile movement. According to Marc Stein, the Dewey's sit-in can be readily associated with the political protest climate of the 1960s, best demonstrated by the black freedom struggle, New Left youth rebellion, and anti-war mobilization which included the anti-racist sit-in movement that began with the 1960 Woolworth's lunch counter sit-in in Greensboro, N.C. It was also significantly influenced and supported by the national homophile movement that began in the 1950s in Los Angeles and San Francisco. In the mid 60s, right around the time of the Dewey's sit-in, the homophile organizations began direct action campaigns. Stein, Marc. City of Sisterly and Brotherly Loves: Lesbian and Gay Philadelphia, 1945-1972. Temple University Press, 2004.